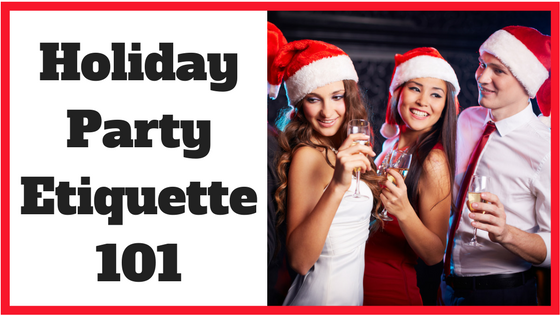 At this time of year holiday parties and events are all around us. Whether you are a job seeker or already working at a company, navigating holiday parties can be tricky at times. After all, you don’t want to make a fool of yourself after one two many cups on punch or stand out like a sore thumb in your best ugly Christmas sweater at a black tie affair. ‘Tis the festive season but that does not give you a license to dress however you wish. My advice? Dress professionally. It’s great to roll out that party dress or Christmas tie. However, avoid anything too low-cut, with too much skin showing or outlandish and leave the denim for the weekend. After all, it’s the holidays and a great excuse to get dressed up! And, of course, if they have a set a specific dress code or theme, dress accordingly. To drink (alcohol) or not to drink? Here’s where your mom’s advice can come in handy. If you do drink, drink in moderation. Years ago a colleague of mine got so drunk he road down the stairs on the ice-sculpture (a Santa on a motorcycle) at the company party. Sadly, to this day (he no longer works for the company), he is remembered most for this antic. Don’t be that person. You want to remembered for your sparkling personality and your good conversation, not for any holiday stunts or drunk infused stupor. If you feel like hitting the dance floor, do it! But, again the rule of thumb I recommend is to keep it tasteful. Dancing a little too close with the CEO might not be appropriate and may cause some water cooler come Monday. However, dancing in general is definitely a good thing. Time to enjoy some festive activities. What are some conversation starters? This time of year is a great time to be curious about others, whether they are your co-workers or other attendees of a colleague’s party or networking event. Ask questions and really listen. It’s not often we do this and especially this time of year when everyone is so busy. Try to take a moment to really listen to what someone is saying. You might try asking them what their holiday traditions are – keeping in mind everyone is different and there are many different holidays celebrated at this time of year. Avoid conversations around politics or religion. Try asking if they have time off and, if so, what they might be doing. Or if they have plans for the New Year. Being curious about others is a great way to start the conversation. It’s a great time of year to network. In December, people are in a good mood and are often more generous with their time. I’ve had clients presented with job offers at this time of year – so networking could bring you some great leads and maybe even a job offer. Remember when networking, it is a two-way street. Ask how you can help the other person with their networking. Maybe there is someone you can connect them with. If you are job searching, a great tip is to mention companies/organizations you are interested in working for. Be open, thank people for their help and remember to follow-up. Having business cards with you is also appropriate.